Copying a legal contract may not have the consequences you'd expect. 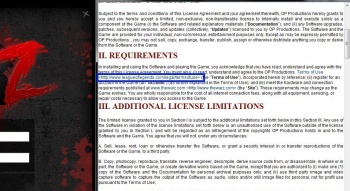 In an embarrassing moment for The War Z developer Arktos Entertainment Group, a copy of the game's License Agreement has popped up with the League of Legends Terms of Service copied in. Embarrassing for Arktos in particular, as the man who founded this private equity and investment company - which is helping to create Hammerpoint Interactive's War Z - is Sergey Titov, formerly of Riot Games. Riot, you may recall, is the company that owns League of Legends. One Reddit user who noticed the faux pas claimed that the actual terms of service document was fundamentally the same as the League of Legends terms, but that it had The War Z in the title rather than League of Legends. The same user also claimed that the document read "The War Z (the "Game") is a free-to-play computer game developed and operated by OP Productions." League is free-to-play with optional in-game purchases; if you want to play The War Z, you pay at launch for the download, but - though The War Z will feature in-game purchases - there are no fees after that. Here's the fun part. Say for the sake of discussion that game company A did copy-paste game company B's Terms of Service, and passed it off as their own. What crime has been committed, if any? It could potentially be classed as copyright infringement, but copying legal documents is something lawyers do all the time. They have to, because even one misplaced comma in a contract can cost millions; once a contract lawyer finds a form that works, he, or she, sticks to it like stink on the proverbial monkey, since the slightest deviation could be catastrophic. In short: while this looks bad, the consequences may not be as dire as you might think. No lawyer's going to be in a hurry to thump a colleague for doing something that lawyers do all the time, potential copyright infringement or not. If anyone has a reason to be feeling uncomfortable right now, it's the person who drafted the document, since The War Z folks might like a quiet word.